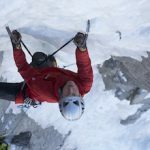 The Scott Muir Jacket, aimed squarely at the alpine climbing crowd, hits its target with a climbing-friendly fit, excellent breathability, and tough layers of extra protection right where ascent-minded folks want ‘em. Who wants to stop and layer up for a 10 minute cloudburst? This hoody combines strategically-placed waterproofing with a decent DWR treatment and fast-drying stretch fabric to keep those brief showers from slowing you down. And the hood itself is fully adjustable for dialed-in defense against ridgetop winds. The body fabric is more than breathable enough to compensate for the non-breathable waterproof zones – we only noticed heat build-up in the shoulders when the ambient temps climbed into the mid-60’s. Given its impressive wind-resistance, the Muir’s breathability is excellent. Roomy and stretchy, the Muir never limited our movements; the hood adjustments were somewhat restrictive at times, but we’d rather have a secure and slightly stiff-feeling hood than an unruly one. Though it didn’t affect the performance of the jacket, the body felt baggy and slightly awkward. And while we were never really uncomfortable, we’d have been even more comfortable with softer seam-finishing at the neck. 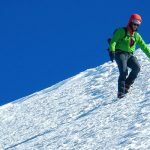 There were a few little things that held the Muir back from being downright awesome: too-low handwarmer pockets, a chapstick-or-gu-but-not-both-sized chest pocket, and so-so gusseting under the arms weren’t necessarily problems, but we noticed them. The jacket was otherwise precisely built and professionally finished. 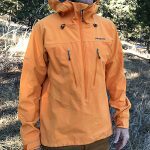 While the Muir Jacket’s MSRP is close to those of similarly-performing softshells, we felt that its strong initial quality and dialed blend of performance attributes delivered better-than-average value.